Distributed Automation (DA) refers to various automated control techniques that optimize the performance of power distribution networks. In contrast to transmission networks, distribution networks have historically not included much sensing and control outside the substation. DA is considered a core part of a smart grid, interacting with almost all other smart grid applications and making it more efficient and reliable. Due to the proliferation of renewable energy and its distributed generation, smart operation of the grid has become more important to address the uncertainty in power generation, difficulties in load flow optimization and voltage regulation. This project located in Turkey in the Antalya region aims at overcoming these main challenges and making the grid operation more efficient and reliable. For this purpose, a novel distribution automation approach is being proposed by utilizing renewable energy forecasting, remote sensing and smart control techniques via specially designed control software and smart devices. Hyper-local, reliable meteorological nowcasts and forecasts provide the firm base for DA by predicting loads generated by distributed renewables and also demand. 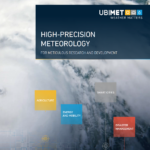 Accordingly, UBIMET provides forecasts of global radiation, wind power and precipitation (for hydropower forecast) in a downscaled high temporal solution that is fully compatible with data flow standards in state-of-the-art and future energy systems.